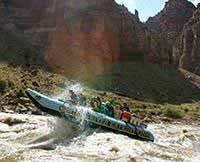 How to Describe a Cataract Canyon Rafting Trip? I want to share a video with you, crafted by a recent guest we had on the Cataract Canyon 4 Day Trip. If a picture is worth a thousand words, then video combined with crafted storytelling says…well, even more! Here is a link to the video our guest produced, we have featured it in our gallery. As the reservations manager for our Utah rafting trips I spend a lot of time on the phone trying to describe the journey or the experience of rafting in places like Cataract Canyon. I love my job, but I struggle to put into words what the experience is really like. If you’ve been on a rafting trip with us you likely know exactly why I struggle to put it into words! It is a bit longer than most of our videos, so take the time during a lunch break, or watch it tonight while you sink into bed. Dream of yourself on the river… there’s still availability this year in Cataract Canyon, and as you can tell from the video the rapids are still loads of fun this year. Book quickly to grab your spot! If not this year, I encourage you to look at the 2019 dates we just made available for booking next year (at this year’s prices, mind you!). I look forward to helping you decide on a trip, and… enjoy the video!